Paperback, 224 pages, 11.8 x 18.7 cm, 4.6 x 7.4 in. Everything we need for a happy existence is actually already within us. Yet something always seems to be not quite right – in career, relationship, health, finance, or some other core area of life. 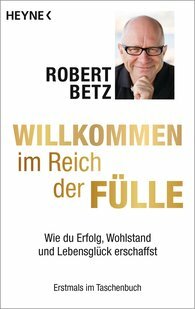 Robert Betz shows how we can transform such conditions of defect or deficiency – and create and enjoy success, abundance, and fulfilment. He addresses not only the mental aspects of this, but also in particular the emotional and spiritual ones as well. And these have to do with the wisdom of the heart: whoever learns to listen to the heart and be faithful to its messages will astonishingly and gratefully experience far-reaching changes deep within oneself and in life.